A NASA spacecraft bound for Pluto has captured its first photo of the dwarf planet's largest moon Charon, a cosmic snapshot snapped from nearly 550 million miles away. The new Charon photo was taken by NASA's New Horizons spacecraft, which is closing in on Pluto and due to fly by the icy world in July 2015. The black-and-white image shows Charon as a dim object that is near, but clearly separate from, the brighter object that is Pluto. Charon is visible for the first time in pictures taken by the Pluto-bound New Horizons spacecraft. Image released July 10, 2013. "The image itself might not look very impressive to the untrained eye, but compared to the discovery images of Charon from Earth, these 'discovery' images from New Horizons look great!" said New Horizons project scientist Hal Weaver of Johns Hopkins University Applied Physics Laboratory, Laurel, Md. "We’re very excited to see Pluto and Charon as separate objects for the first time from New Horizons." Pluto has five known moons: Charon, Nix, Hydra, Styx and Kerberos. Charon is the largest of the five and orbits Pluto at a distance of about 12,000 miles (19,000 kilometers). It is about 750 miles (1,207 km) wide and was discovered in 1978 by astronomers using the Kaj Strand Astrometric Reflector at the U.S. Naval Observatory’s Flagstaff Station noticed a visible "bump" moving around Pluto, New Horizons mission scientists explained. The four other moons of Pluto were discovered in images taken by the Hubble Space Telescope. The official names for Styx and Kerberos, which were formally called P4 and P5, were unveiled last week. New Horizons scientists used their spacecraft's LOng Range Reconnaissance Imager, called LORRI, to take the new Charon photos. 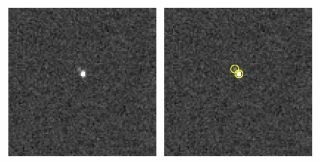 The camera took six different photos of Charon and Pluto, which scientists used to create a single composite view of the dwarf planet and its biggest moon. "In addition to being a nice technical achievement, these new LORRI images of Charon and Pluto should provide some interesting science too," New Horizons principal investigator Alan Stern of the Southwest Research Institute in Colorado said in a statement. Charon is visible as a “bump” moving around Pluto in the moon’s discovery images, taken with the 1.55-meter (61-inch) Kaj Strand Astrometric Reflector at the U.S. Naval Observatory’s Flagstaff Station in 1978. Because of the unique angle of the New Horizons photos, they may hold new clues into the surface properties of Charon and Pluto, including the potential for a layer of fine particles blanketing their surfaces, New Horizons officials explained. NASA launched the $700 million New Horizons mission in January 2006. Currently, New Horizons is about 550 million miles (880 million km) from Pluto. But it will be much closer on July 14, 2015, when it makes its closest approach to Pluto and its moons. On that day, the spacecraft zoom within 7,750 miles (12,500 km) of Pluto and should provide spectacular views of the dwarf planet and its moons. "We're excited to have our first pixel on Charon," Stern said, "but two years from now, near closest approach, we'll have almost a million pixels on Charon – and I expect we'll be about a million times happier too!" Editor's Note: This story was corrected to reflect the proper diameter of Charon (750 miles/1,207 km).